China has a love-hate-envy relationship with the United States. The Chinese people love American culture and can’t get enough of the American movies, videos, and music — much of it on the internet. Yet the Chinese government blocks much of the internet because the cultural trends of these same Chinese people, most of them young and with growing affluence, worries older leaders in Beijing. China envys the U.S. and its powerful military and almost unchallenged influence in the world. Leaders crave such influence and dispatched the first ever long-range naval mission far from China in modern times when ships went to fight piracy near Somalia last December. China is building an aircraft carrier, its first ever, and the incident at sea between Cninese ships and USNC Impeccable last weekend was no accident. China wants the U.S. and the world to know that it is claiming sovereignty over a vast expanse of sea. China aslo loves and fears the U.S. dollar. China has so much reserve money that it has to be invested, and in many ways, that almost always has meant buying U.S. Treasuries. China has invested almost $1 billion in U.S. bonds. This huge holding has to worry the Chinese since the crash of the stock market and the global economic recession — which the Chinese blame on U.S. debt and greed. “We hate you guys. Once you start issuing $1 trillion-$2 trillion… we know the dollar is going to depreciate, so we hate you guys but there is nothing much we can do…. The global recession means China’s exports have ground to a halt and along with that, many factories and factory jobs stand idle. About 20 million Chinese people, many of them migrant laborers, returned home last January and are out of work. China is rushing aid to the unemployment and fears social unrest. China will have an aircraft carrier “very soon,” a top Chinese naval officer told a newspaper published Friday, fueling speculation over a pending official announcement on the long-awaited project. The Global Times newspaper cited east China fleet commander Adm. Xu Hongmeng as saying China possessed both the ability and motivation to build a carrier — a weapon system that is strongly backed by the navy but somewhat less enthusiastically by the People’s Liberation Army’s top commanders. “China really needs a carrier. Both technologically and economically, China already has the capacity to build a carrier,” said Xu, who was quoted while attending the national legislature’s annual session in Beijing on Thursday. “China will very soon have its own aircraft carrier,” he told the paper, published by the Communist Party mouthpiece People’s Daily. Xu’s remarks came on the day the central government announced its 2009 budget, including a 14.9 percent rise in military spending this year to 480.68 billion yuan ($70.27 billion). No breakdown of the defense budget was provided. President George W. Bush landed Saturday on the USS George H.W. Bush, a new aircraft carrier named after his father — the ultimate honor for a decorated Navy pilot from World War II. With just days left in his presidency, Bush and first lady Laura Bush joined his father, now 84 years old, and other Bush family members at Naval Station Norfolk in Virginia for the commissioning of the nuclear-powered carrier. The steel-gray vessel is more than three football fields long, one in the Nimitz class of nuclear-powered aircraft carriers that are the largest warships on the world. Its price tag is just as hefty: $6.2 billion. The mood was celebratory aboard the ship, spit and polished for its unveiling. The Marine One presidential helicopter ferried the president, his father and their wives to the ship. It was sunny, but a chilly breeze blew across the deck of the ship as the president, his father and their wives got off the helicopter with their wives. The elder Bush, sporting a purple scarf inside his overcoat, walked with a cane from the helicopter to a golf cart. He got in the back seat with former first lady Barbara Bush; the president grinned and waved as he took the driver’s seat with his wife by his side. China’s dispatch of two warships to help battle Somalian pirates has drawn an ambivalent global reaction – a sign of the decidedly mixed feelings toward its bid for big-power status. Two destroyers and a supply ship steamed out of a southern Chinese port Friday, on China‘s first patrol and potential combat mission beyond Chinese waters. The ships are due to reach the Gulf of Aden by Jan. 6 and carry 870 crew members, including 70 elite Navy special forces trained in close combat and helicopter-borne raids, according to the China Daily newspaper. Two days earlier, a Chinese defense official, at a rare press conference, gave one of the clearest indications yet that China plans to build an aircraft carrier. The developments reflect China’s determination to boost its sea power, in line with its rising economic and political clout. “Now we have more overseas interests and activities, so that’s why we need a stronger force on the oceans,” says Peng Guangqian, a military expert in Beijing. The United States frets about how a bulked-up Chinese Navy might complicate a Taiwan conflict scenario. But it welcomed the decision to join amultinational naval “posse” battling Somalian brigands, who have turned waters off east Africa into a hazardous pirates’ alley and wreaked havoc on world trade. Still, some of China’s Asian neighbors have expressed concern about its naval muscle-flexing. The first deployment of three Chinese ships to the coast of Africa in hundreds of years means China is becoming more involved in world and international matters. The pirates in Somalia are causing insurance prices to rise for everyone. So China’s committment and involvement causes many to applaud. But not everyone is applauding China’s naval moves. Many worry. 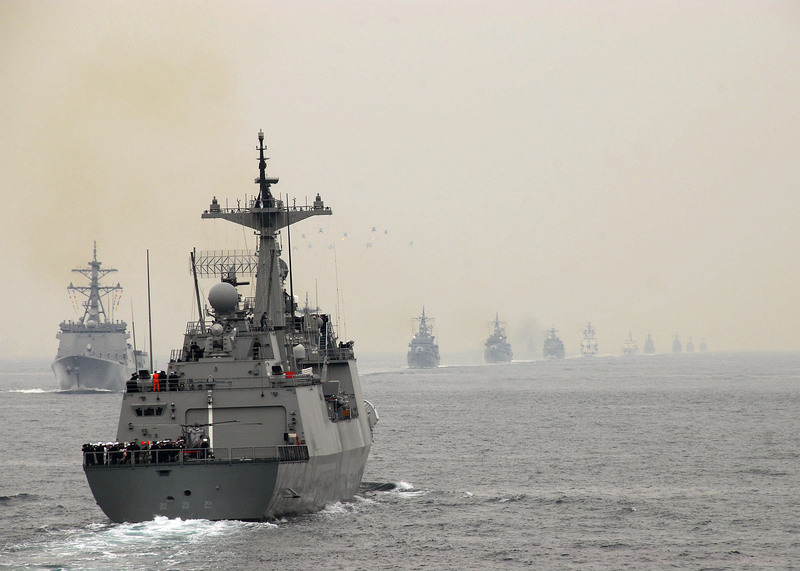 Japan, South Korea and Vietnam, to name just a few nations, worry that China’s growing naval strength means China will eventually want something in Asia and have the power to take it without too much discussion. Even Pacific Ocean nations like Australia worry that China will become too dominant in the region. Here at Peace and Freedom, readers from Vietnam, Japan and South Korea have swamped us with questions about China’s actual strength at sea — and China’s intent. And why does China need a large navy? What is China’s “Grand Strategy”? “I think the objective of the grand strategy is to squeeze out, very slowly and very gradually, the influence of the United States in East Asia, without war, with economy and culture,” said Chong-pin, Professor at the Graduate Institute of International Affairs and Strategic Studies at Tamkang University in Taiwan. The “Grand Strategy” will ultimately include aircraft carriers. China will “seriously consider” building aircraft carriers to protect its vast maritime territory, a spokesman for the Ministry of National Defense said on just last week as the anti-piracy mission was being prepared. Huang Xueping made the remarks at a news conference called to announce details of a Chinese flotilla that departed for Somali waters on Friday to protect Chinese ships from pirates. Asked whether the Chinese navy’s first deployment abroad is a good opportunity to build a carrier, Huang said the government would seriously consider the issue. “Aircraft carriers are a symbol of a country’s overall national strength as well as the competitiveness of its naval force,” Huang said. “China has a long coastline and the sacred duty of China’s armed forces is to safeguard the country’s marine safety and sovereignty over coastal areas and territorial seas,” he said. China has many mineral rights and oil disagreements at sea with Japan, Vietnam and other nations — and a poweful navy means to these countries that China will, before long, lay down the law from Beijing on other regional neighbors. Most worriesome to the United States and those neighbors of China is this: no one really knows how big and capable China’s navy has become or how much China is spending on naval programs. Beijing’s rapidly growing military spending, estimated at $85 billion to $125 billion last year, is still dwarfed by the United States, where a half-trillion dollars is shelled out for defense spending each year, not counting money for the wars in Iraq and Afghanistan. The nonpartisan Congressional Budget Office last year said the U.S. Navy needs to spend about $21 billion annually on new ship construction over 30 years to meet its goal of a 313-ship fleet. That is far above the Pentagon’s average spending between 2000 and 2005, and about $6 billion more than President Bush requested for this year. But it is China’s secrecy on military spending and programs that causes so many to worry in Asia — and that is why U.S. Secretary of Defense Robert Gates frequently speaks about the need for “transparency” in both China’s military investments and their intentions. China’s military spending and intentions are hidden behind a fog of state controlled media and government secrecy. Of course: we can all trust China. China’s willingness to send ships so far from home is also the latest example of the growing power and confidence of the country’s navy. In recent years, the military has been loading up on warships, planes, missiles and other weapons — a beef-up that has worried its neighbors and the U.S.
Those most concerned include the Japanese and South Koreans, who have long-standing disputes about territorial waters that occasionally flare up. China has also been locked in an uneasy stand off with the Philippines, Vietnam and other Southeast Asian nations over the ownership of the potentially oil-rich Spratly Islands in the South China Sea. Denny Roy, a senior fellow at the East-West Center in Hawaii, said countries in the region will view China’s mission off Somalia differently. “For Japan and some in South Korea, this is another step in the unwelcome growth of the Chinese navy as a capable blue-water force, which has only downsides for Tokyo and Seoul,” said Roy, an expert on China’s military. “I think the objective of the grand strategy is to squeeze out, very slowly and very gradually, the influence of the United States in East Asia, without war, with economy and culture,” said Chong-pin, Professor at the Graduate Institute of International Affairs and Strategic Studies at Tamkang University in Taiwan at Princeton. But he said most Southeast Asian countries may see China’s involvement in the anti-piracy campaign as a positive thing. It would mean that China was using its greater military might for constructive purposes, rather than challenging the current international order. Roy said the answer is that China is unwilling to rely on the U.S. to protect China’s increasingly global interests. Beijing still believes it needs to enter the field, Roy said, and that leaves open the possibility of a China-U.S. naval rivalry in the future. 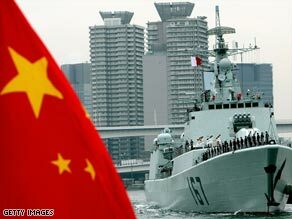 China has said the mission’s purpose was to protect Chinese ships and crews that have come under attack from pirates. The vessels would also be willing to share intelligence and conduct humanitarian rescue operations with other countries involved in the anti-piracy efforts, Senior Col. Huang Xueping, spokesman of the Ministry of National Defense, said Tuesday. China’s top military spokesman said it is seriously considering adding a first aircraft carrier to its navy fleet, a fresh indication of the country’s growing military profile as it prepares for its first major naval deployment abroad. At a rare news conference Tuesday, Chinese defense-ministry officials played down the importance of Beijing’s decision to send warships to the Gulf of Aden to curb piracy — China’s first such deployment in modern history — saying it doesn’t represent a shift in defense policy. The two destroyers and supply ship are to depart Friday for the Middle East. 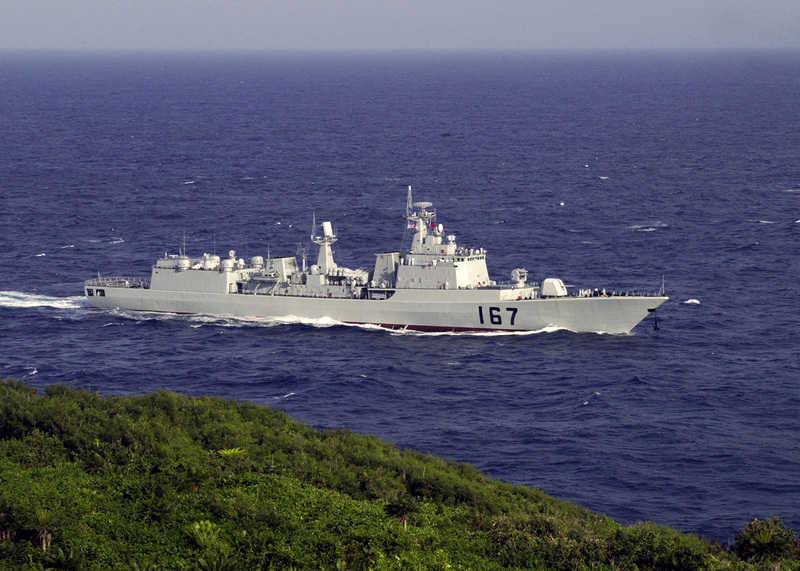 Above: Missile Destroyer Haikou 171 of the PLA Navy’s South China Sea Fleet is seen in this undated file photo. China’s navy will send two missile destroyers and a supply ship to the waters off Somalia this week to protect Chinese vessels and crews from pirate attacks. But officials also made clear that China’s navy, which has been investing heavily in ships and aircraft, now has the capability to conduct complex operations far from its coastal waters — and that Beijing is continuing to expand its reach and capability, perhaps with a carrier. It’s unclear what parts of an aircraft carrier China would build itself and what parts it might need to acquire from abroad. 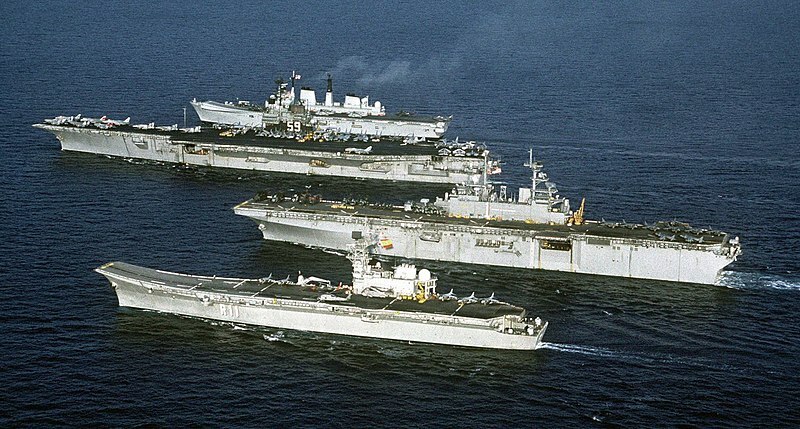 China has bought carriers before, but none ended up in the country’s fleet. China has stepped up spending on its navy and the rest of its armed forces in an effort to modernize and strengthen them. Much of the defense push has been driven by China’s increasingly global commercial interests. Its economy depends on trade and imported oil and raw materials. China says its ships in the Gulf of Aden will operate under United Nations rules of engagement, including a U.N. policy on when to engage pirates. “We are sending our naval force as part of international cooperation, according to a specific situation,” Capt. 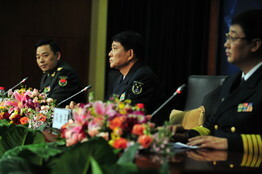 Ma Luping, director of the navy bureau of China’s general staff, said at the news conference. However, China doesn’t plan to “always send the navy whenever there is the loss of Chinese personnel or Chinese property,” he said. The new mission includes protecting deliveries of humanitarian aid to Somalia. China will cooperate with other navies and commercial ships operating in the area, Capt. Ma said. Since Aug. 15, countries have dispatched warships and planes to participate in antipiracy patrols in the Gulf of Aden and Indian Ocean waters of Somalia. But international forces have been stretched too thin to effectively curb the increasingly daring and sophisticated pirates. Col. Huang’s comments on the possibility of adding a carrier indicate renewed interest in an idea whose popularity has waxed and waned in Chinese defense circles for decades. In 1985, China purchased a decommissioned carrier from Australia. It was scrapped after Chinese technicians studied the ship, but a replica of the flight deck was built for pilot training. China later acquired three former Soviet carriers. Two have been turned into floating military theme parks, while the Pentagon says the third — unfinished when purchased — has undergone work; it remains unclear what China plans to do with it. Carrier operations are extremely complex. Building the hull of an aircraft carrier is relatively easy. Learning to integrate air and surface operations, training air wings, and developing the sophisticated systems required for modern naval aviation could take years. U.S. government and independent analysts say it could be 2015 or 2020 before China could be ready to deploy an operational carrier. —Gordon Fairclough in Shanghai contributed to this article. China’s Ministry of National Defense spokesman said Tuesday that aircraft carriers are “a reflection of a nation’s comprehensive power” and are needed to meet the demands of a country’s navy. The Chinese government would seriously consider “relevant issues” with “factors in every aspects” on building its first ever aircraft carrier, said the spokesman Huang Xueping when responding to a question on whether it was a good opportunity at present to build China’s aircraft carrier, at a press conference. China has reportedly been working to rapidly modernize its fleet. The ministry was explaining to reporters the deployment of the Chinese Navy as a convoy task force against pirates off Somalia. Three Chinese ships would head for the Somali region on Friday. Russia today still has a large number of nuclear-powered submarines armed with cruise missiles and nuclear attack submarines in service. For instance, there are five Project P671 SSNs in service in the navy alone, eight Project 949B SSGNs and more than 10 Project 970 serial SSNs. Moreover, the first of the latest-generation P885 SSNs already has been launched. The Russian navy has enough warships and large-tonnage nuclear submarines to form three aircraft carrier fleets immediately. This is in sharp contrast to China’s People’s Liberation Army navy’s rather obsolete capabilities. Russian Deputy Prime Minister Sergei Ivanov, who is in charge of Russia’s defense industry, said recently that an investment of close to $180 billion would be required to build three aircraft carriers. His remark could be inaccurate — the actual cost should be closer to $20.8 billion. Prime Minister Vladimir Putin recently gave the go-ahead to build the new aircraft carriers, in any case. Putin said last February that building the carriers would boost the Russian economy and improve the social well-being of the country before 2020. Still, this is a huge budget, especially under current global financial pressures. Russia had hoped to cooperate with foreign countries in one way or another to lower the total cost. This is one reason Russia has been closely watching both China’s and India’s aircraft carrier construction programs. You are currently browsing the archives for the aircraft carrier category.